Looking for a completely new board game experience for the upcoming holidays? Check out Shadows in The Forest, by ThinkFun. You play Shadows in the Forest in the dark. In fact, the darker the room, the better. One person plays the Seeker. The others play Shadowlings, cute little mask-wearing creatures that hide in the shadows. 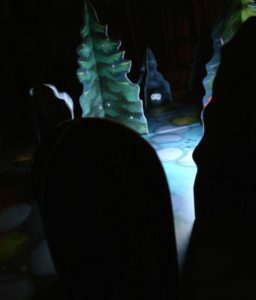 If you’re the Seeker, you roll the glow-in-the-dark die, and then move your LED lantern around the board, looking for Shadowlings. If you spot one, you steal its mask. Get all the masks, and you win. After your turn ends, close your eyes. You have to keep them closed during the Shadowling’s turn. Actually, I’d recommend stuffing a pillow over your face just to be on the safe side.